New Horizons Passing the Orbit of Saturn. Click on image to enlarge. New Horizons crossed the orbit of Saturn on June 8, passing yet another interplanetary milepost on its voyage to Pluto and the icy environs of the Kuiper Belt. 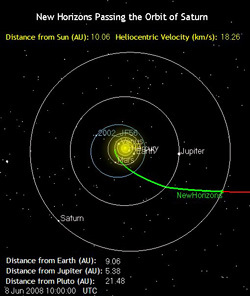 Spinning in healthy, electronic hibernation, New Horizons reached a distance of 10.06 astronomical units (about 935 million miles or 1.5 billion kilometers) from the Sun at 10:00 universal time, becoming the first spacecraft to journey beyond Saturn’s orbit since Voyager 2 passed the ringed planet nearly 27 years ago. In fact, Voyager 1 and 2, at the edge of the Sun’s heliosphere some 100 AU away, are the only spacecraft operating farther out than New Horizons. 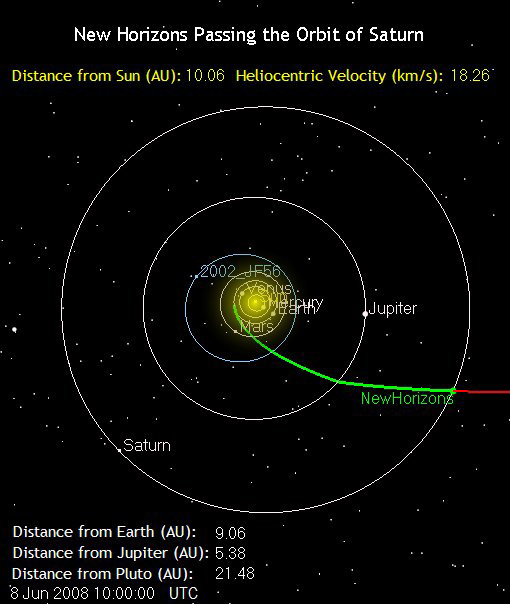 New Horizons has crossed the orbits of three planets since its launch in January 2006, though only one – Jupiter, in February 2007 – was close enough for a gravity boost and for the spacecraft to study. Saturn is more than 1.4 billion miles (2.3 billion kilometers) from New Horizons at present. After a productive two-week series of system checks, maintenance activities, and software and command uploads,the spacecraft is humming through the outer solar system at 40,850 miles (65,740 kilometers) per hour. The New Horizons team expects to keep the spacecraft in hibernation until Sept. 2. Next checkpoint on New Horizons' journey is the orbit of Uranus, which it crosses on March 18, 2011. Follow the spacecraft to Pluto and beyond.